Making our projects Wireless always makes it to look cool and also extends the range in which it can be controlled. Starting from using a normal IR LED for short distance wireless control till an ESP8266 for worldwide HTTP control, there are lots of ways to control something wirelessly. In this project we learn how to build wireless projects using a 433 MHz RF module and AVR microcontroller. We use Atmega8 for the RF Transmitter and Atmega8 for the RF Receiver section. We interface an LED and a Pushbutton with Atmega8 microcontrollers. On the transmitter side, we Interface Pushbutton with Atmega and transmit the data. On the receiver side, we will receive the data wirelessly and show the output on LED. We use encoder and decoder IC to transmit 4 bit data. Reception Frequency is 433Mhz using cheap RF TX-RX module available in the market. We use CodeVisionAVR software for writing our code and SinaProg software for uploading our code to Atmega8 using USBASP programmer. Before going into the schematics and codes, let’s understand the working of RF module with Encoder-Decoder ICs. Pushbutton to Pin B0 of Atmega. 1M-ohm resistor between pin15 and 16 of HT12E. Pin17 of HT12E to data pin of RF transmitter module. Pin 18 of HT12E to 5V. GND pin 1-9 and Pin 14 of HT12E and Pin 8 of Atmega. LED to Pin B0 of Atmega. Pin14 of HT12D to data pin of RF receiver module. 47Kohm resistor between pin15 and 16 of HT12D. GND pin 1-9 of HT12D and Pin 8 of Atmega. LED to pin 17 of HT12D. 5V to pin 7 of Atmega and pin 18 of HT12D. Step 4:- Click on Ports. In Transmitter part, Pushbutton is our input and 4 data lines are output. So, we have to initialize 4 pins of Atmega as output. Click on Port D. Make Bit 7, 6, 5 and 4 as out by clicking on it. Step 6:- Make a New folder on desktop so, that our files remains in folder otherwise it will be scattered on whole desktop window. Name your folder as you want and I suggest use the same name to save program files. We will be having three dialogue boxes one after other to save files. Do the same with other two dialogue boxes which will appear after you save the first. Follow the same steps to create files for Receiver part. In receiver part, only Led is our output so make Port B0 bit to out. We will write code for toggling the LED wirelessly using RF. Complete code for both the Atmega at transmitter and Receiver sides are given at the end of this article. First Include delay.h header file to use delay in our code. Now, come to the last lines of code where you will find a while loop. Our main code will be in this loop. In While loop, we will send 0x10 byte to PORTD when button is pressed and, will send 0x20 when button is not pressed. You can use any value to send. First declare variables above void main function for storing incoming character from RF module. Now come to the while loop. In this loop, store incoming bytes to a char variable byte and check if the incoming byte is same as we write in our transmitter part. If bytes are same, make PortB.0 high and take NOT of PORTB.0 for toggling the LED. After building the project, a HEX file is generated in the Debug-> Exe folder which can be found in the folder which you have made previously to save your project. We will use this HEX file to upload in Atmega8 using Sinaprog software. 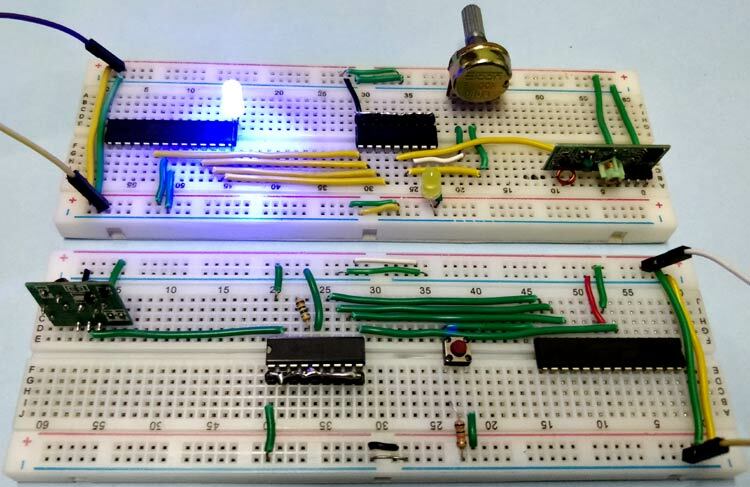 Connect the remaining components on the breadboard as per circuit diagram and open the Sinaprog. You are done and your Microcontroller is programmed. Use same steps to program another Atmega at receiver side. Thank You Very Much. I loved all the tutorials.